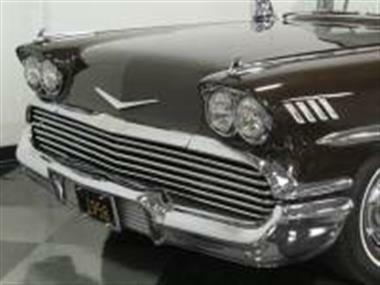 Chevys 1958 Impala was a landmark automobileand#44; and the one-year-only design seems to have finally found its place among the most sought-after cars of the 1950s. This one isnt strictly stockand#44; but it has the right lookand#44; and with a smooth-running 350and#44; a great color combinationand#44; and a few subtle custom touchesand#44; it manages to stand out without erasing everything that was great about the original look.<br /> <br /> The longand#44; low shape of the 58 Impala is easy to recognizeand#44; and this one still wears its Bowtie look with pride. 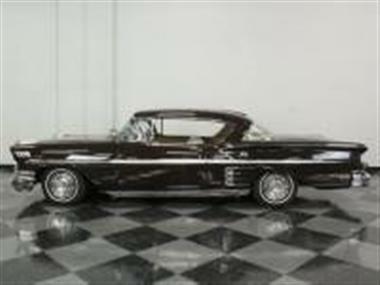 But on closer inspectionand#44; youll find a car that has been tastefully upgraded in the early 60s styleand#44; giving it a look thats just a little bit different. 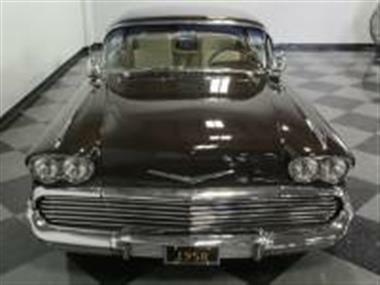 Of courseand#44; the handsome chocolate brown paint helps and its quite nicely doneand#44; so you will be eager to get it out to shows. The bodywork underneath is equally niceand#44; and like all dark colorsand#44; this really is the most important part of the joband#44; so they seem to have really spent the extra time to get it right. Gaps are very good and aside from a few polishing marksand#44; it looks veryand#44; very fresh. 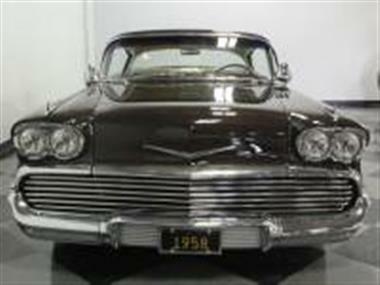 None of the original stainless trim was removedand#44; so it has that bigand#44; flashy chrome 50s lookand#44; although the front grille has been replaced with a smooth tubular setup that gives the big Imp an entirely different look. 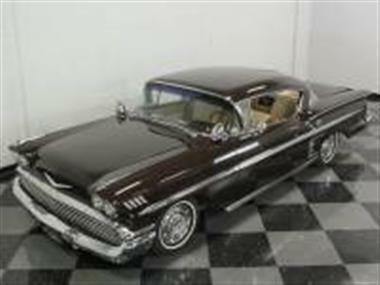 It also carries a set of teardrop spots and clear headlight lensesand#44; which are subtle details that make a big impact.<br /> <br /> Working in conjunction with the brown paintand#44; the two-tone tan and cream leather interior has a correct look thats just a little differentand#44; much like the exterior. The pleated inserts are comfortable and the sophisticated look works especially well with all the bright trim work inside the car. The original steering wheel has a matching tan leather wrapand#44; but the wheel itself is unmodified and it frames the original dashboardand#44; complete with the wide speedometer and dual temperature and fuel gauges. An under-dash A/C system is a welcome additionand#44; as is the AM/FM/cassette stereo head unitand#44; and theres a slick Bandamp;M shifter on the transmission tunnel for managing the upgraded TH350 3-speed automatic transmission. 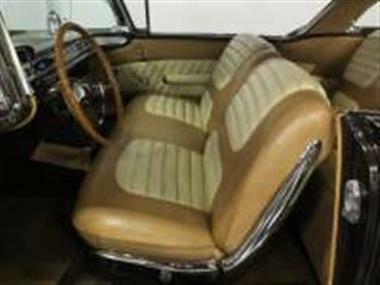 Full-sized comfort really means something in the spacious back seatand#44; which is set up like a pair of bucketsand#44; and the giant trunk is well-upholstered with brown carpets that give it a finished look.<br /> <br /> The top engine in 1958 was a 348and#44; but this one goes two cubes better by being a 350 cubic inch V8. Beautifully detailedand#44; it really sparkles in the big Imps engine bay. 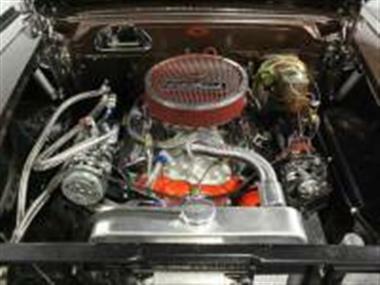 Edelbrock supplied the intake manifoldand#44; carburetorand#44; and air cleanerand#44; and with Chevy Orange paint on the blockand#44; theres no mistaking this for anything else. A big aluminum radiator up front keeps everything nice and cooland#44; even on the hottest daysand#44; and all the accessories are newand#44; including the alternator and A/C compressorand#44; which uses R134a refrigerant. The transmission is the aforementioned TH350 3-speed unitand#44; which is a nice improvement over the original PowerGlide 2-speedand#44; and it feeds what appears to be the original rear end. 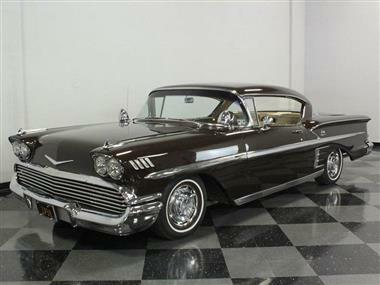 A newer exhaust system with glasspack-style mufflers sounds 50s perfect and the stance is exactly right. 205/70/14 whitewall radials on steel wheels with hubcaps are surprisingly low-key on such a flashy carand#44; and the look totally works.<br /> <br /> Theres a great deal of time and money invested in this handsome Impalaand#44; and it offers all the upgrades that youd want in a car built to cruise. Call today!